I came to Dharamsala for a yoga teacher training September 2017, and the Dalai Lama happened to be giving four days of teachings at his home temple the week before the start of my course. (As many of you may know, Dharamsala has been home to the Dalai Lama for the past half century and is the seat of the Tibetan government in exile. I didn't actually know that until about 8 months ago.) Prior to coming to Dharamsala, I didn’t know much about the Dalai Lama at all. The extent of my knowledge was: he is some kind of Tibetan spiritual figure, I think he's Buddhist. He has a cool name, he’s said some very beautiful, quotable things and has a great sense of humor. I also had a general sense that he was one of the coolest people on the planet and a very wise man to boot, so I signed up for those teachings. The building with the white canvas roof is the Dalai Lama's temple. For those of you whose knowledge is as limited as mine was on this subject, here are the cliff notes to bring you up to speed: the current Dalai Lama is the 14th Dalai Lama, considered to be a reincarnation of the prior Dalai Lamas, a highly evolved being who chooses to reincarnate for the benefit of all sentient beings. (The methods the Tibetan high lamas use to find each reincarnation are fascinating – if you want to know more, the Dalai Lama describes them in the autobiography of his early years Freedom in Exile, a fantastic book I highly recommend.) He was the political and spiritual leader of Tibet until 2011 when he stepped down as political leader, transferring that responsibility to the democratically elected prime minister Lobsang Sangay. He has lived in exile in Dharamsala since 1959, when he escaped from Tibet following China’s military takeover of Tibet. Many Tibetans followed him and a large Tibetan community now resides in Dharamsala, peacefully intermingled with the local Indian community. Their devotion to the Dalai Lama is both inspiring and heartwarming. In spite of his high position and the reverence displayed toward him, the Dalai Lama remains a humble man who dislikes formality and views himself as just one more human among 7 billion humans on the planet. I dutifully registered for the talks at the Tibetan Security Office in Mcleod Ganj and, as instructed, purchased a small radio with headphones that allows listeners to tune into simultaneous translations of the talks. The first morning of the teachings, the check-in process was busy and crowded, but orderly. The crowd was a mix of Asians, Westerners, Indians and maroon-robed monks. 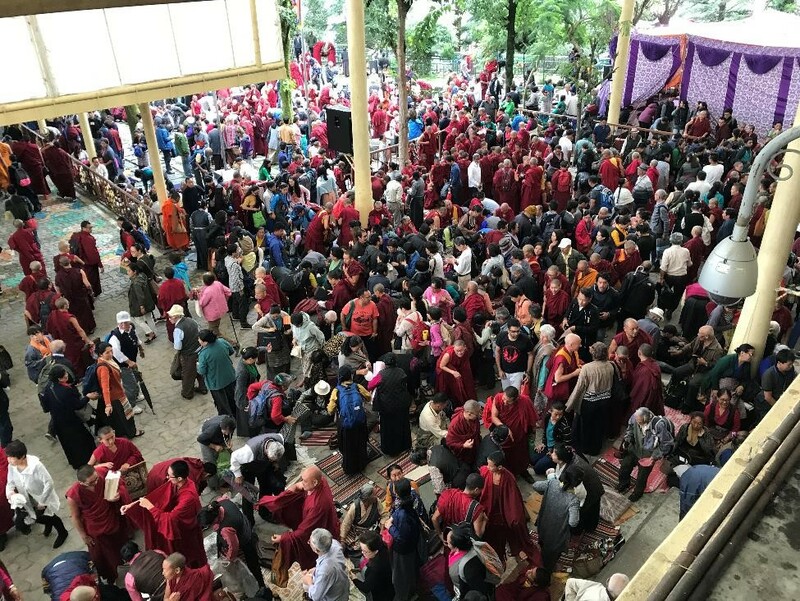 Soft, soothing chanting filled the air – I later learned the chants were in honor of the 14th century Tibetan lama Tsongkhapa, founder of the Gelugpa sect of Tibetan Buddhism. It was beautiful. “Chen chen ray zee…” is the part that sticks most in my head and the calming, melodic sounds provide a subdued backdrop to the unfolding event. A little after 8:30am the Dalai Lama entered, surrounded and supported by his security detail. Everyone in the crowd brought their palms together in front of their hearts when he appeared. As he walked slowly through the pathway among the seated crowds, stopping to smile at people, shake their hands, sometimes talk with them, something unexpected happened. Something about his presence – this man whose life is entirely dedicated to serving his people, who is a spiritual icon for so many, yet who views himself as just a humble monk, who has suffered much but remains joyful, compassionate, good-natured and playful – something about the selfless, loving, joyful purity of his soul and the sight of the love and devotion people feel for him squeezed my heart and brought tears to my eyes. I’ve never felt something like that before in the presence of another human. And I wasn’t the only one affected that way. Later, when I talked to others who were there, they reported experiencing the same reaction, men and women alike. It was an experience that was at once humbling and inspiring. It made me want to become a better, kinder, more selfless, more compassionate person. The teachings were interesting and insightful – the Dalai Lama talked a lot about both Buddhism and science, and how the basic nature of humanity is compassionate. They were also funny, at times – my favorite thing was when he would say something funny and then burst into cackling laughter at his own joke, something he does on a pretty regular basis. 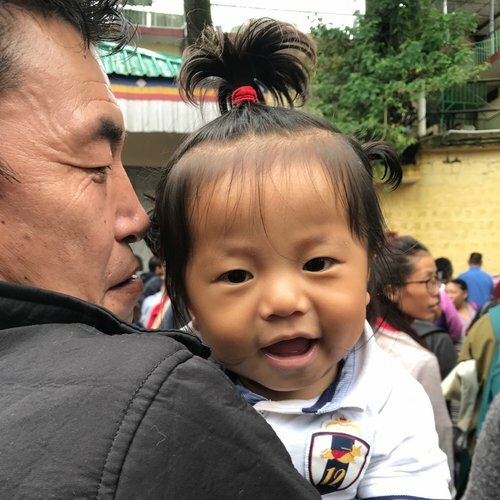 But the memory that sticks most clearly in my mind is what his presence made me feel and the sight of the quiet, loving reverence of the Tibetan people for him. Below left to right: Buddha inside the temple; awaiting His Holiness's arrival; crowds milling in the temple's outer section; even the babies seem calm and happy here.